Are You Fed-Up Of Trying To Install Complex Scripts? "Here's A Package Of Simple PHP Scripts That Anyone With A Basic Knowledge Of Installing Scripts Can Handle!" 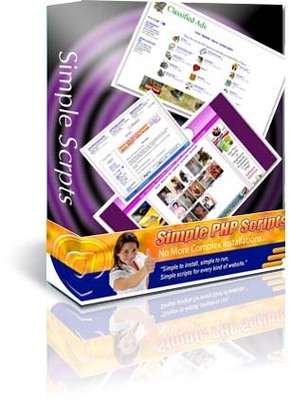 - Are You Sick Of Scripts That Are Far Too Powerful For Your Simple Website Needs?.. Simple, easy to install, easy to use PHP scripts that won't break the bank.! But are they for you? Well, let's take a look at what this package contains, then you can make up your own mind. Script #1 - "Classified Ads"
Script #2 - "Apartment Search"
A very simple, but very effective affiliate program. Affiliates get paid an amount you specify for every visitor they bring to your site. Complete with cheat protection! A very simple frequently asked questions script. Not one, but two guestbook scripts. Simple helpdesk script. Could easily be modified to add reCaptcha capabilities. Script #8 - "Link Trader"
Simple dating script...could be used for many other things. Script #10 - "Photo Ratings "
Not one, but FOUR ranking/rating scripts! Script #11- "Paypal Store "